I am pleased to see that the company has just released its first video for 2011, which continues the tradition of curve-adoring footage from this visionary label. Courtney does a great job as always, although she is burdened with a regrettably unattractive hairstyle. Joining her as the other brunette is Kate Erin, who was mentioned in last years thread about BGM Models. Kate actually looks curvier and more attractive in this video than in any of her print work. See 00:59, for example. She does a splendid job, and has to be considered the star of this particular video. I especially love the final scenes showing these luscious models eagerly and seductively digging in to a rich dessert, while the camera catches a glimpse of Kate coyly showing off her deep decolletage. Nothing could be more liberating and pro-curvy than seeing well-fed models unapologetically loving to eat, and looking gorgeous doing so. Every month, I eagerly look forward to the new CityChic videos. They are always so gorgeous. I adore the fact that they are filmed in a variety of themes and styles. Not only do they show off the company's clothing better than any still images ever could, but they demonstrate what a size-positive media would look like, a media in which gorgeous plus-size models and actresses (i.e., actually attractive women) played the ingénues, the vixens, the girlfriends, etc. Watching the CityChic videos back to back is like seeing the world the way it should be; or rather, seeing our media world the way it should be. This latest one is a cinematic tour de force in moody black and white, with a sultry soundtrack. Courtney Maxwell moves her size-16 body in sensual ways, adopting graceful, feminine poses. I love the theme of the plus-size model admiring herself in the mirror. At one point, it almost looks as if she is going to kiss her reflection in the glass. 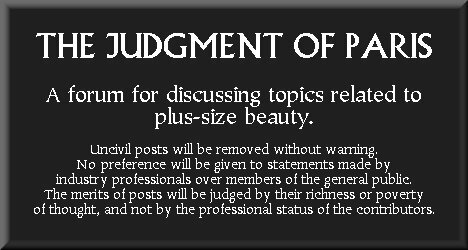 Such self-adoration and vanity is extremely sensual to watch, and shows full-figured goddesses that they deserve to see themselves this way. As soon as I saw the above video, with Courtney Maxwell admiring herself in the mirror, I knew that it reminded me of something. I think it was the black-and-white photography that tipped me off. 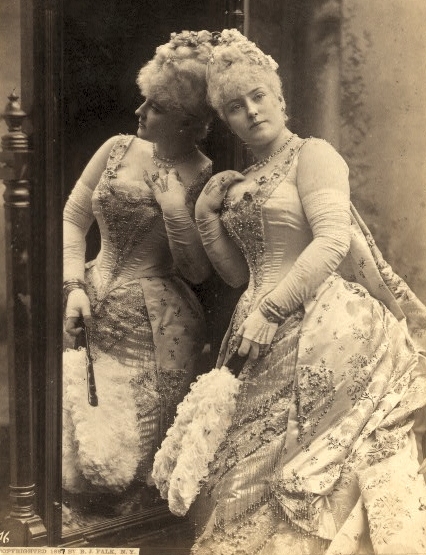 It recalls a very famous shoot featuring 19th-century goddess Lillian Russell, in which Lillian was photographed standing alongside a full-length mirror, dressed in an opulent manner. How very fitting that a present-day plus-size model should be photographed in a manner that recalls the most gorgeous plus-size goddess of all time. But the influence continues. That Lillian Russell shoot also inspires the current campaign from Vivienne Westwood, starring Christina Hendricks. Christina is not fully plus-size, but her buxom curves do recall the timeless ideal of voluptuous feminine beauty. Also, notice the decorative hair arrangement, with the leaves. That too recalls a 19th-century type of opulent styling. You can see that Lillian, in the above image, wears a similarly elaborate hair arrangement. Full-figured goddesses of every era, past and present, look gorgeous in opulent settings where the sumptuousness of the décor echoes the aristocratic richness of their luxurious curves. This is pure "maximalism." It's not quite as luxurious as the captivating mirror video, above, but City Chic has now released a behind-the-scenes video showing three of its models in preparation for the company's forthcoming fashion show. Courtney and Kate Erin are the two standouts in the video. Interesting thing about Kate -- initially, her look is attractive but not extraordinary, but after she has been made up, wow, she becomes quite stunning. (I especially love Kate's ultra-glamorous look at 0.31, and in the final triptych.) It's a fascinating example of how some effective makeup artistry can really bring out a model's look. Plus, there are many casual glimpses of the models showing the fullness of their figures.